September 23, 2015 September 23, 2015 by Beau H.
Editor’s note: For a plethora of Online Shopping Picks delving into accessories, footwear and knitwear, head right this way. Ready to take on fall in this “old” photo circa 2014. Tan herringbone blazer & chambray shirt by J. Crew. Pocket square by Banana Republic. Slim jeans by Scotch & Soda. Shawl cardigan by GAP. Knit tie by Frank & Oak. Brown wingtip boots by JC Penney. Stainless steel dive watch by Invicta. Glasses by Burberry. Photo credit: Khoa Nguyen. As is often the case in the world of men’s style, it seems that sometimes the seasons change too quickly — on the writing front, that is. Last week, we tackled excellent henleys to transition into fall weather in earnest (for most of us, at least), and now your humble author will gladly take a stab at the best cold-weather blazers out there on the market — because those things have been on shelves far too long now for you not to buy one, right? Keep in mind that a great lighter weight blazer (one from this list) could definitely transition into the slight chill of fall when layered appropriately. Heck, I even have an unconstructed blazer I’ve worn in the Michigan winter, layered up with a V-neck sweater (of course). But let’s say you want something thicker to stand up to chilly weather — a la the trusty J. Crew blazer (sadly, long gone from shelves) at the top of the page. That’s what this edition of Online Shopping Picks will cover — but you’ll have to foot the rest of the bill for a new jacket. [Editor’s note: Some might take issue with the definition of a blazer here — these styles are sometimes called sportcoats — but we’ll stick with blazer terminology for now. To clear up any confusion, head here]. 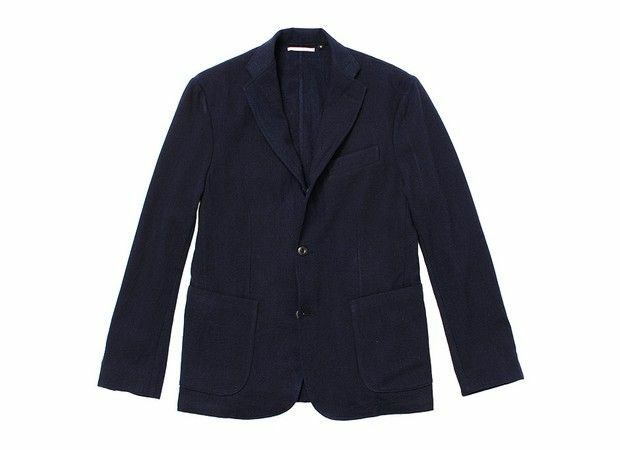 As previously seen on this site’s Fall Style Wish List, Uniqlo delivers on another great fall & winter blazer. Does this jacket look familiar at all? Of course it does (at least if you caught it at the top of my Fall Style Wish List). Some might have issues with Uniqlo’s fit, as the tail of its jackets and its sleeves generally run a little shorter and slimmer than most, but the brand does make an outstanding jacket (is it a blazer? a sportcoat) for the price. These jackets certainly lean casual given the lack of construction, but in a deeper, saturated shade like the Grey Plaid on the far left or even the Dark Green option as seen on the site, it’s a jacket that could absolutely be paired with dress trousers and some sharp black shoes for the office. A four-season shade of navy merged with suede elbow patches for fall and winter. Rustic, slightly throwback-focused details like suede elbow patches have been making a comeback in clothing items for the past couple years now, and designers aren’t pulling the plug on this added touch just yet. In the case of this blazer, it works quite well, calling to mind old hunting jackets. And this piece has some other things going for it, too — namely, you get J. Crew-like quality at a lower price than some similar models at the big brother retailer. The slightly flashier touch of those elbow patches is grounded by a nice shade of navy, which should work well over dark denim or grey wool trousers. The patches make it more casual and thus a little less versatile — thus dropping it to spot no. 2 here. Still, it’s a jacket that could see a lot of use in the coming months. If you’ve got some bulk to you and want a jacket that ditches the elbow patches, the mainline brand is making a blazer in a similar shade in its roomier, more athletic Crosby fit. The ideal balance of tradition and modern style, done up in an on-trend color and luxurious fabric. Whoa, now. Almost $400 for a blazer? In spot #3? Yes, yes indeed — and here’s why. The argument can definitely be made here for investing in quality pieces that provide a long-term benefit; a terrific wool blazer, sure to be warm, well-made and endlessly versatile, can serve you well for seasons and years to come. And the way Apolis makes ’em, you know you’re getting a quality product. Not everyone has the kind of, er, capital to invest in such a piece, but this option has all the makings of a classic jacket if you do take the plunge. The double vents and deep indigo color make it the closest to a traditional blazer of any of the bunch seen here, yet it leans modern thanks to the slim fit. Wear it with some broken-in denim, wear it with black corduroy pants for some edge — heck, wear it over a T-shirt. 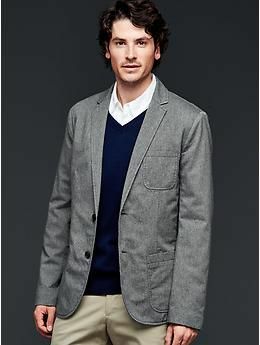 A nice color combo and casual patch pockets make this one blazer to take business-casual … or just casual. Now, that’s more like it. We turn to a reliable standby at an affordable price for option #4. It’s somewhat concerning that the fit looks a bit … off in these photos, so this might be a good pick to try on in store. The price is not so expensive that it’d be too much of a pain to tailor. But note that the sleeves feature functioning cuffs, which can be an absolute mess to get tailored. However, the fabric blend, cool grey color and patch pockets make this an ideal blazer to throw on over, say, a white Oxford, red V-neck and dark jeans in a business casual setting — if the fit is on-point. Since the patch pockets do push it into casual territory, you could even mix it up and toss it over a long-sleeve henley. A word to the wise — keep your eyes open for the launch of The Hill-side’s capsule collection for GAP very soon; there’s likely to be a great blazer or two in there (Editor’s note: Check out the full rundown via GQ as of 9/23). 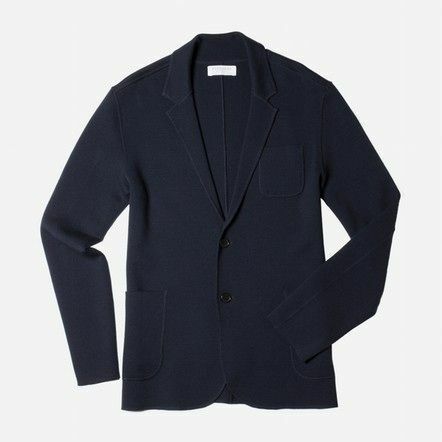 Part blazer, part sweater and all casual style in one high-quality Everlane piece. Is this a sweater? A blazer? A swacket? Whatever you call it, the Luxe Sweater Blazer definitely walks the line between casual and crisp style — exactly the type of versatility a nice blazer (or swacket) should provide in the colder months. It should almost wear like the Uniqlo wool blend jacket seen at the top of the page — easygoing enough over a crewneck sweatshirt (for both warmth and casual style), and high-quality enough to pair with a chambray dress shirt. From personal experience with Everlane, its products fit slim, and jackets like these often feature a nice hint of stretch — key when you still need mobility underneath a topcoat. This is one blazer in particular that would pair especially well with high-low combos — think slim chinos plus vintage-inspired runners. The competition across the board as this post was assembled was pretty cutthroat (or as cutthroat as writing about blazers can be). 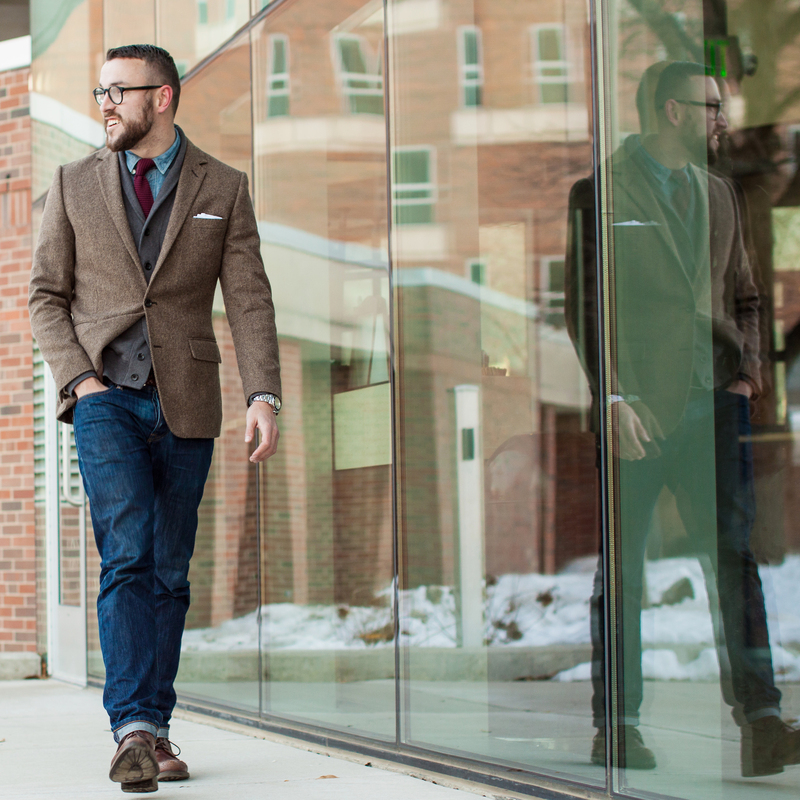 Brands like Bonobos, with its Italian Knit Blazer, are giving more established brethren like J. Crew a run for their money in the looks (and price) department. 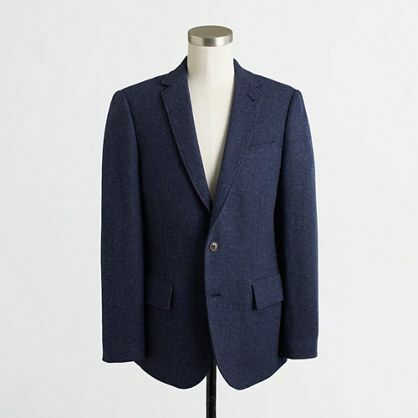 As was previously alluded to, The Hill-side is also quickly establishing itself as a player in the splurge blazer game — this Selvedge Mini-Houndstooth Tailored Jacket in Indigo has a great workwear vibe to it, not to mention a high price. Stick to affordable (or at the very least, classic) and versatile options when picking up a great blazer or two this season though, and you’ll reap those rewards as soon as the leaves start to turn. What’s your go-to fall and winter blazer? Are you planning on refreshing your closet with any of the picks here?